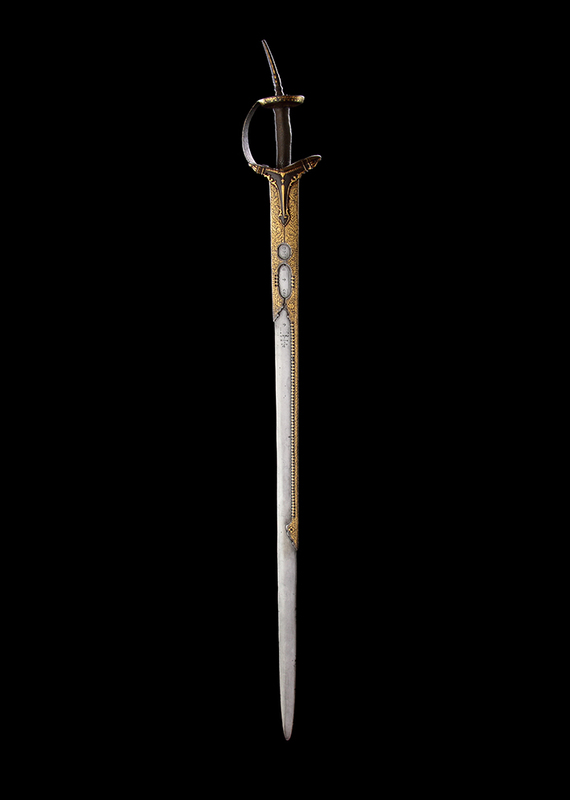 As befits a firanghi (literally meaning foreigner), this sword has a European blade, probably of 16th century Spanish or Italian origin. It retains its various symbols, crosses and letters, and has been partially enclosed by long reinforcing plates that present exquisite gold decorations of rows of crosses and meandering flora—chiselled, pierced and engraved. The Indian basket hilt and its long pommel stalk (its length meant to allow two-handed use) is similarly festooned with gold, as is the arcing knucklebow and the styled langets that protrude over the blade. The grip has been covered in vegetable fibres. European sword blades were highly prized in India at this time and they were often mounted on Mughal dynasty hilts like this one, with only the most expensive receiving marriages of this enviable quality.